E3 Metals is developing Petro-Lithium – a new source of lithium from reservoirs associated with oil and gas production. E3 has three NI 43-101 Inferred Mineral Resources in our permit area totalling 6.7 Mt of LCE (Lithium Carbonate Equivalent). The company is in the process of commercializing lithium extraction technology that has the potential to unlock significant value from this expansive resource. In parallel to our internal technology development, E3 is actively observing industry developments to identify potential options that may complement the Company’s process or provide an alternate solution. In 2019, it is our goal to pilot the ion exchange technology in the field to produce large volumes of highly concentrated lithium enriched feedstock. This product will be upgraded at existing sites to produce lithium products. Operation of this pilot plant could lead to the design and construction of a demonstration pilot plant in 2019. Petro-Lithium brine occurs deep within the Leduc Formation in Alberta as dissolved lithium ions in formation water. Of the billions of litres of fluid contained within the pore space in the Leduc Formation, about 95% or more is Petro-Lithium brine. The remaining ~5% is hydrocarbons. The Leduc reservoir is 100’s of m thick and exhibits exceptional flow rates and deliverability due to favourable rock properties and pressure. 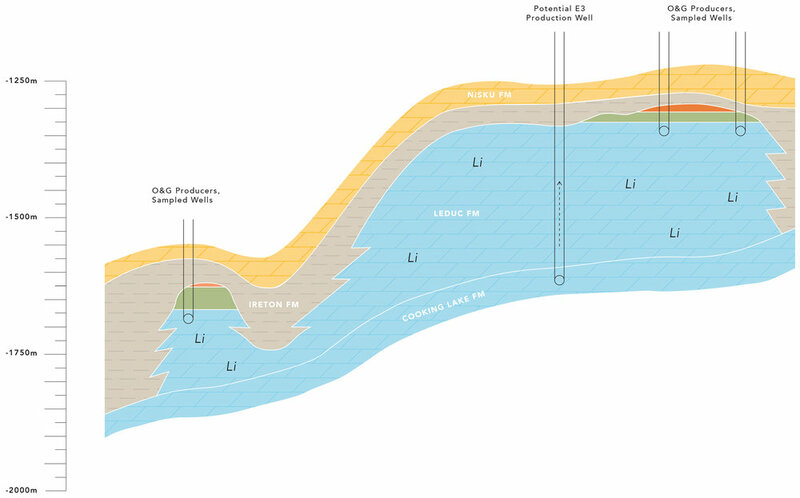 Geological cross section (W-E) through the Leduc reef in the Clearwater permit area. Oil and gas production is restricted only to the upper portions of the reservoir; E3’s commercial development will involve deeper wells, potentially away from oil and gas production. E3 Metals believes the key to project feasibility is the development of an efficient lithium extraction technology that can be deployed using a direct brine process. Direct brine processing achieves several important production challenges. Firstly, it improves the recovery of lithium from brines significantly compared to evaporative salars, from 50% to over 90%. Secondly, it produces lithium in as little as 2 days compared to 18-24 months. Finally, it improves environmental performance significantly by reducing land use to a fraction of that used for evaporative ponds. The ion-exchange technology E3 is developing alongside the University of Alberta is a relatively small portion of the overall flow sheet. It transforms Alberta Petro-Lithium brine into a concentrated, purified feedstock. This feedstock can then be upgraded to pure lithium salt products for use in lithium ion battery components using commercially available technology. Because E3’s technology development slots directly into commercial processes, the overall technology risk is significantly reduced. Ion-exchange is a well understood chemical process that swaps similarly charged ions on a sorbent. The sorbent developed by E3 and the U of A has a high selectivity for lithium. Lab work has demonstrated up to 16x concentration factor and over 90% Li recovery while attracting less than 10% impurities in the brine. This low-energy concentration step requires no solar evaporation and produces a concentrate that can be purified by technologies available on the market. E3 Metals is scaling this proprietary technology in partnership with two of Canada’s leading industrial facilities – GreenCentre Canada and the National Research Council -- to finalize a commercially viable product. This work is supported by Alberta Innovates and the Industrial Research Assistance Program, respectively. E3 Metals owns 76 Alberta Metallic and Industrial Minerals Permits totalling over 1.4 million acres. Our mineral permits are strategically located in Alberta, Canada; a supportive and mature jurisdiction for Petro-Lithium development. Due to existing oil and gas development, project capital costs in E3’s project area are significantly reduced. E3 has already taken advantage of this by tapping into existing infrastructure during our exploration program. Lithium-enriched brine is produced to surface as part of oil and gas production, which eliminates the requirement to drill exploration wells for sampling. After establishing collaborative working agreements with 14 operators over the lease area, E3 Metals leveraged existing infrastructure and the massive public well database in Alberta to produce three NI 43-101 resources with an extremely low finding cost ($0.18/tonne LCE) in a very short time frame (6 months). E3 Metals continues to sample the reservoir and plans to upgrade our inferred mineral resource estimates. E3 Metals’ planned development model involves the use of existing oil and gas sites and the repurposing of infrastructure for production and processing of lithium brine. On these “brownfield” sites, E3 Metals’ brine will be produced at a sufficient temperature (70-100oC) and flow rate (up to 10,000 of m3/d per well), to potentially generate geothermal heat and power on site. The use of this energy for the production of brine from the subsurface and processing of lithium at surface is expected to significantly lower both operating costs and greenhouse gas (GHG) emissions. The Company is confident that its development model will produce some of the world’s most environmentally responsible sources of lithium.